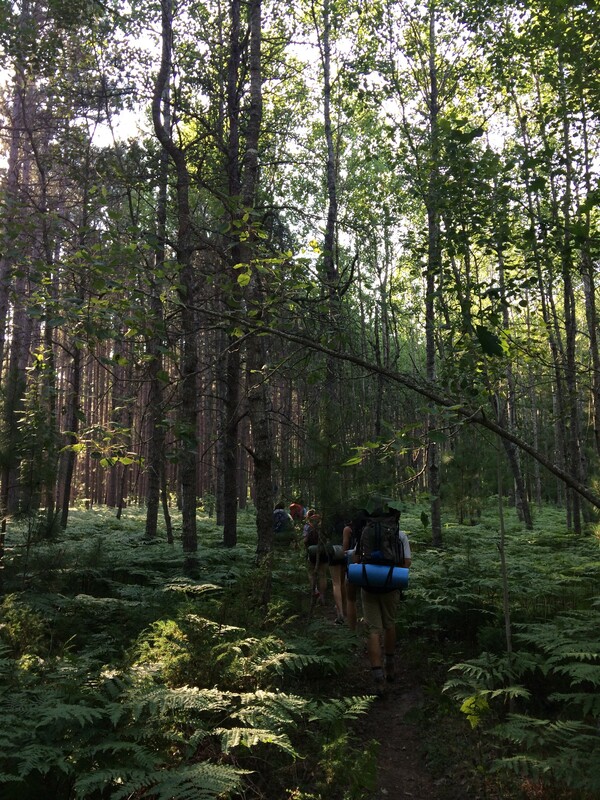 We just returned from a beautiful weekend trip to Michigan’s lower peninsula where we backpacked a 23 mile loop over a relaxed two and a half days. 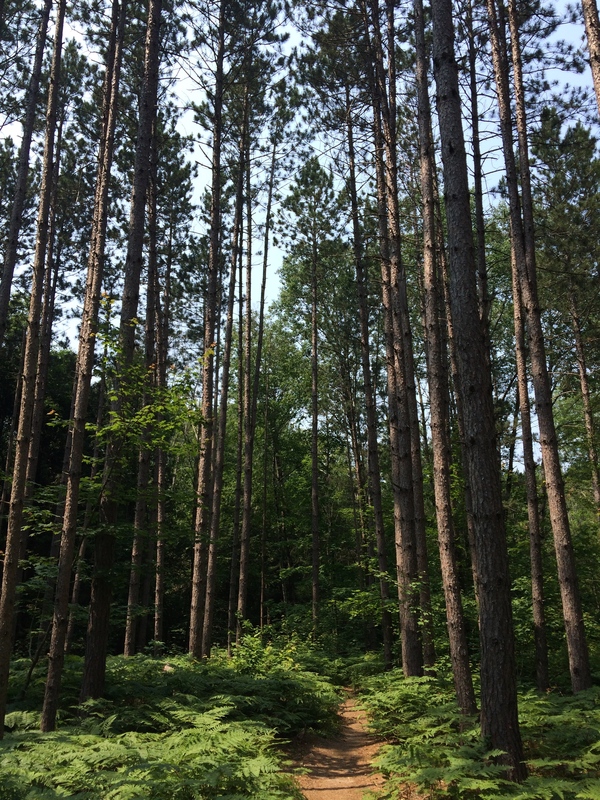 The Manistee River Trail/North Country loop is located near Cadillac, Michigan and is an excellent destination for a short trip. Dave and Garrett were out of town for a baseball tournament, so the rest of us decided to invite a few friends to join us for our adventure. Our group consisted of myself, Sophie, Naomi, Maya and their friends, Jacob, Liz and Megan, none of who had been on a backpacking trip before. 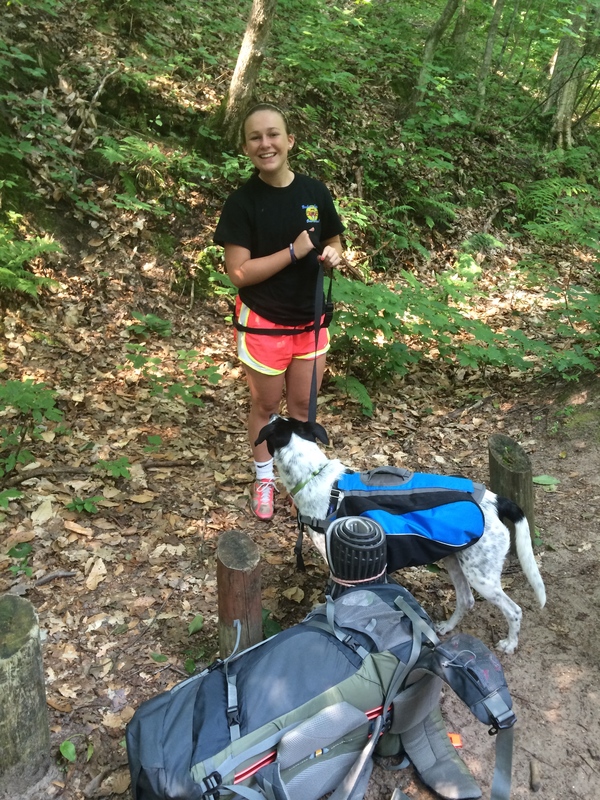 Our one year old hiking dog, Luna, came along as well for her first backpacking trip too. With seven people and a dog, our car was packed with hikers! Leaving early Thursday, we drove up at a leisurely pace, with stops for breakfast and lunch as well as a grocery stop for trip supplies. Arriving late in the afternoon, we chose to start the loop at Seaton Creek Campground where we parked the car in the small lot next to the camp host site for $5 a day. I had printed off a trail map from US Forest Service to use on our trip. The camp host, Ron, walked over to say hello and let us know that while the water pipes were not working at the campground, he had filled a large container with water we were welcome to top off our water bottles with. After we filled up, we set off down the well-marked trail. 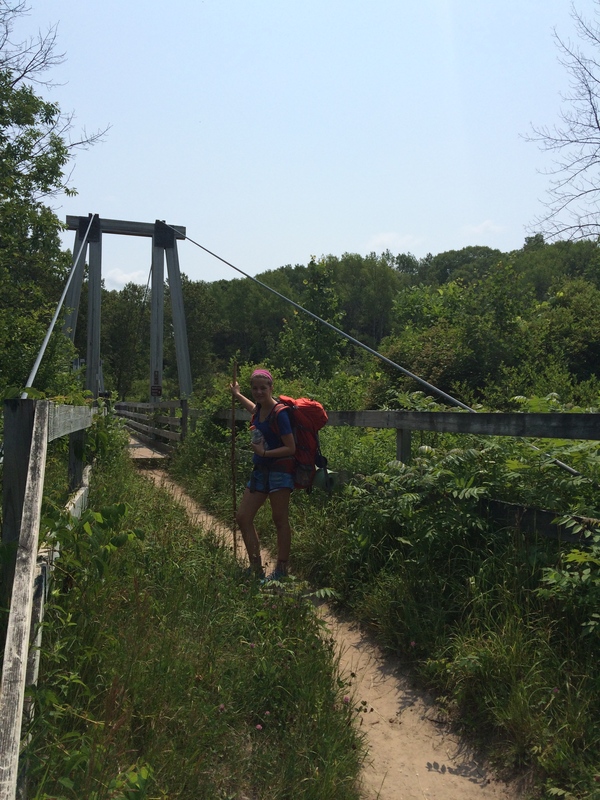 The loop can be done in either direction, and we chose to first complete the white blazed Manistee River Trail, cross the Manistee River at Red Bridge, and then head back on the North Country Trail, completing the loop by crossing the river again at the suspension bridge about a mile away from the campground. 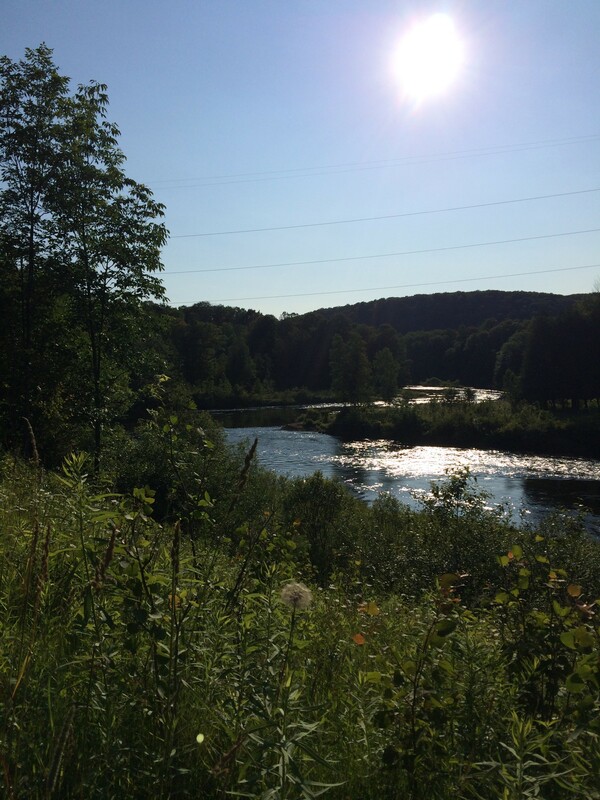 Featuring river views, a waterfall, and varied terrain, the Manistee River Trail is level, well blazed and a great hike for backpackers of any ability. Getting a head start on the holiday weekend, we didn’t see the crowds of hikers that would be heading out later. We happily had our choice of several beautiful sites located along the river shore. 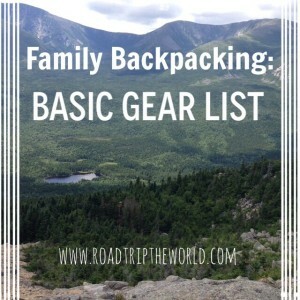 We hiked just a few miles in so we could take our time setting up camp and enjoying our site. There were plenty of trees to set up both the ENO DoubleNest Hammock and inexpensive Nylon Camping Hammock we had brought along to relax in and we spent the evening splashing in the river and hanging around the fire. The next morning we packed up camp and headed back down the trail. The weather was beautiful and quickly warmed up from the chilly morning temperatures. Since the trail hugs the river, the beautiful views are plentiful. Water is also plentiful and we treated water as needed with our SteriPEN several times throughout the day. We arrived at Red Bridge in early afternoon and lounged around for an hour or so to rest before continuing on the blue blazed North Country Trail. Before leaving, we made sure to fill up plenty of water bottles as the trail leads away from the river and water would not be available for most of the return trip. Leaving Red Bridge, the trail climbs almost immediately up Red Hill for a challenging end to our day. While I am sure the view is pretty in the fall or winter without the abundance of leaves, there wasn’t much to see from the viewpoint this time of year. While we took a quick break to catch our breath, we found ticks crawling on to myself, Maya and our dog, Luna, so we didn’t hang out too long before setting off again. Make sure to bring bug spray as the ticks and mosquitoes on this part of the trail were swarming. We made camp a few more miles in. Even on this beautiful Friday evening, we did not encounter many other hikers. Along this part of the trail, there is dispersed camping throughout and we settled upon a well used site just past Forest Road 8060. Since there wasn’t another water source for several miles, we made sure to conserve enough water for the next day’s hike by setting aside several bottles. Waking up early the next day, we had a quick breakfast and hiked out quickly with so many helpers to break camp. The miles really flew by and we arrived at Eddington Creek before we knew it. A beautiful area to relax, we rested and refilled our water bottles. A few miles from here, the North Country trail forks at the connector trail eventually leading over the suspension bridge over the Manistee River. Once again hugging the river, it was amazing how much more crowded the area was then on our hike in the day before. I saw numerous hikers walking the Manistee River Trail across the river and the water was filled with canoes and kayaks. This would be a really fun paddling trip! We did get a little turned around at this point as there are several connector spurs to various campsites and viewpoints. 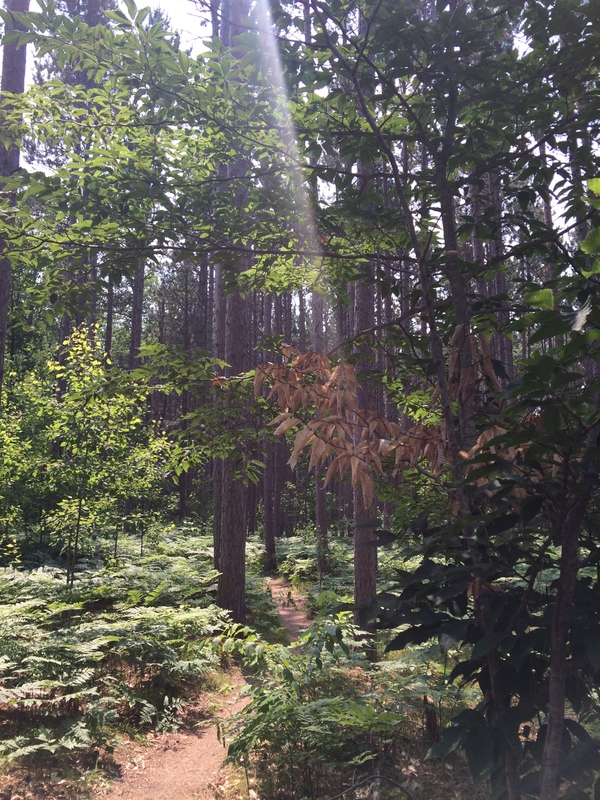 Just follow the white blazes to get back to the Manistee River Trail and you should be fine. Crossing the river at the suspension bridge, we headed back to our car at Seaton Creek Campground to a parking lot much more crowded than when we arrived. This was a fantastic weekend trip and one I would hike again happily! 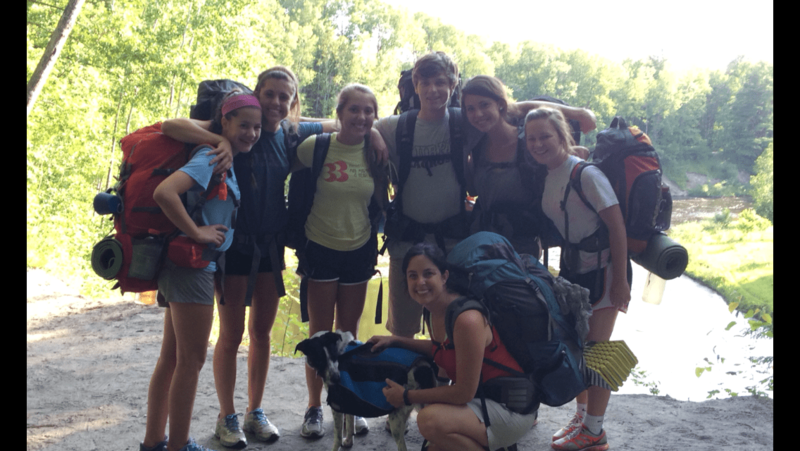 And the best part was that all the new backpackers had a great time and are ready for another hiking adventure. Our hiking dog, Luna, also did great on her first trip and kept up with us easily. While not to scale, a free map of the loop trail is available here. Even in the summer, the air can by chilly overnight so make sure to pack extra layers and a warm sleeping bag. Parking is available at several road crossings. For $5 a day, you can park at the Seaton Creek Campground where the small lot is adjacent to the camp hosts for added security. Make sure to have a water treatment option for this hike. 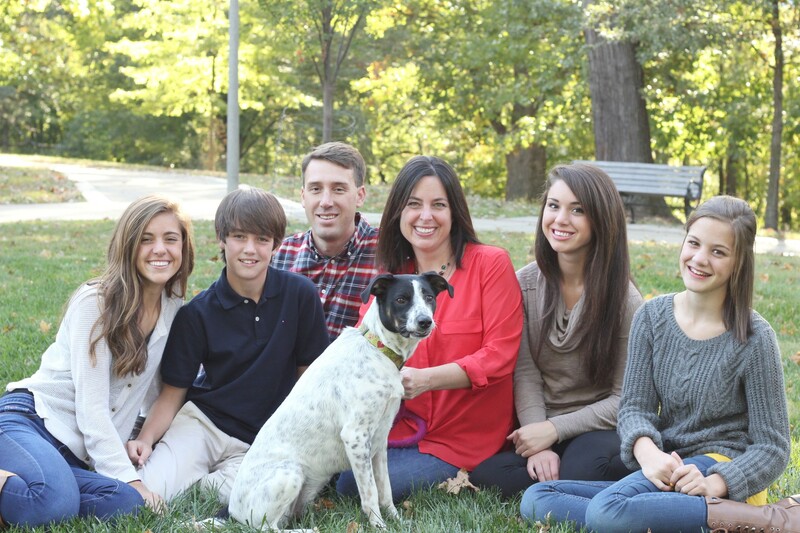 Our SteriPEN was perfect for this. Also, be sure to fill up at Red Bridge as water is not available for about seven miles in on the North Country Trail. Bring a swimsuit as the Manistee River is a refreshing swimming spot. Go ahead and bring your dog. Leashed dogs are allowed on both sections of the loop. 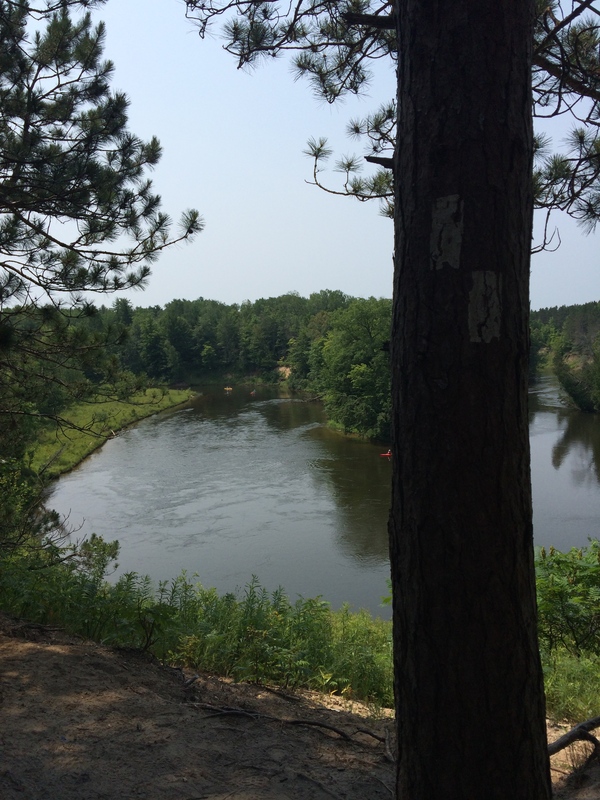 Have you been hiking on Michigan’s Manistee River Trail? What did you think?